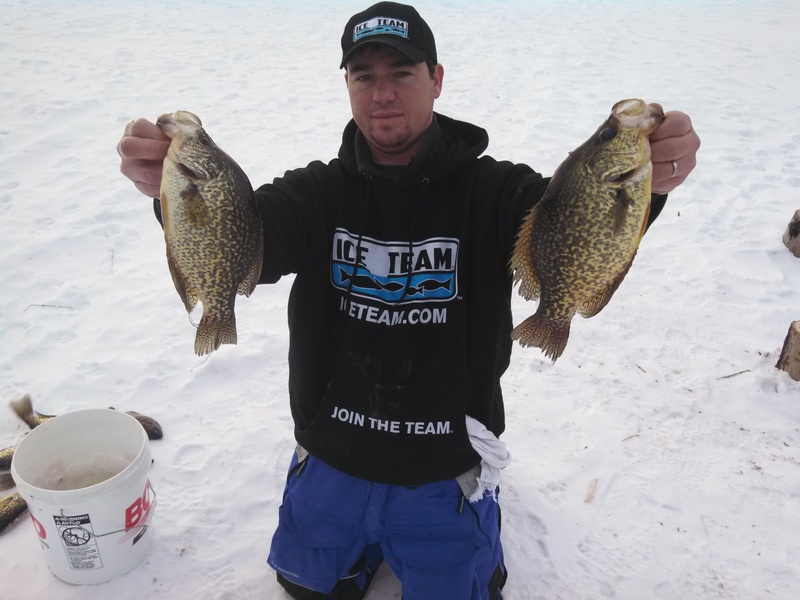 We had the pleasure to be a part of the fourth episode of Ice Team TV and fishing with some of the best that The Clam Ice Team Pro Staff has to offer. This was a great experience and and we appreciate the opportunity. The day started off a little quicker than the previous since we already had the unloading and preparation shots the film crew needed so it was right to fishing. The fish hadn’t moved much from the previous day and since we were fishing the same spot it didn’t take long to start pulling in some quality fish. It was a typical river bite, early morning hours often bring a steady flow of water into the setbacks. It’s important to understand this concept when you’re fishing a river system that has a dam system. It’s actually simple to understand. When water flows into these setbacks, creating a higher water level the fishing is usually good. Why? The water flow causes the zoo plankton and small bait fish to circulate, thus creating a great opportunity for the larger fish to feed, and get caught by us the fishermen. Watch the USGS Water Date site to dam openings and closings in your area. 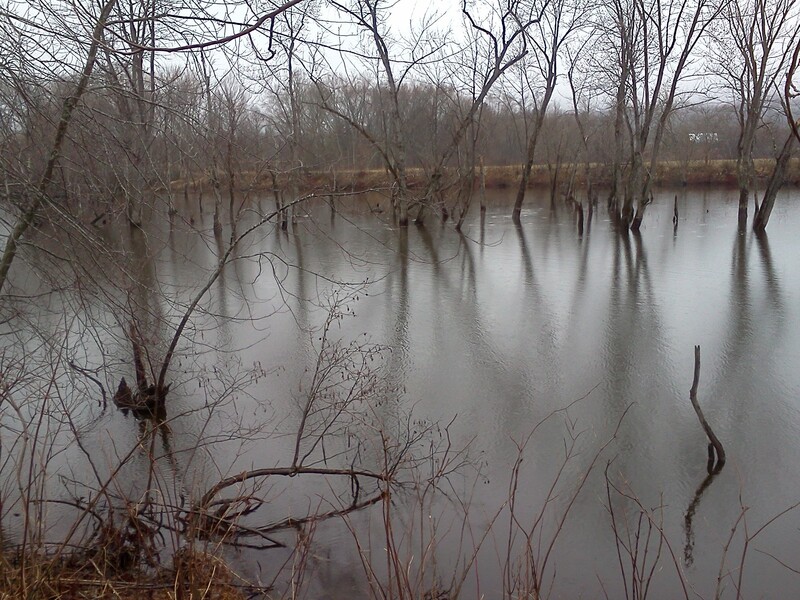 If the setback you fish is between two dams make sure you are aware of both the upper and lower openings and closings. A good in-flow is created when the dam above is open, allowing for more water to come out and when the lower dam is closed or letting out less flow creating a back up of water. As the sun grew higher in the sky the flow also depleted causing the fish to move from the deep channel into the thick weed flats. (Look for the inside turns adjacent to the main channel to hold concentrations of fish.) Fishing slowed down a bit but we were still able to stay with them and pick at them for the next couple hours. Our presentation was a milk pink Maki plastic rigged on a gold head Bentley Tungsten Jig. Later in the day a few red maggots helped to entice the fish into biting. All and all we have a very productive day on the setback. Make sure to watch for episode four from Ice Team Tv to pick up more tips and tricks from the ice world. Bring It! This fish was caught early in the morning in the channel while the water was flowing into the setback. The summer has been a productive one on the river for us with the walleye bite. 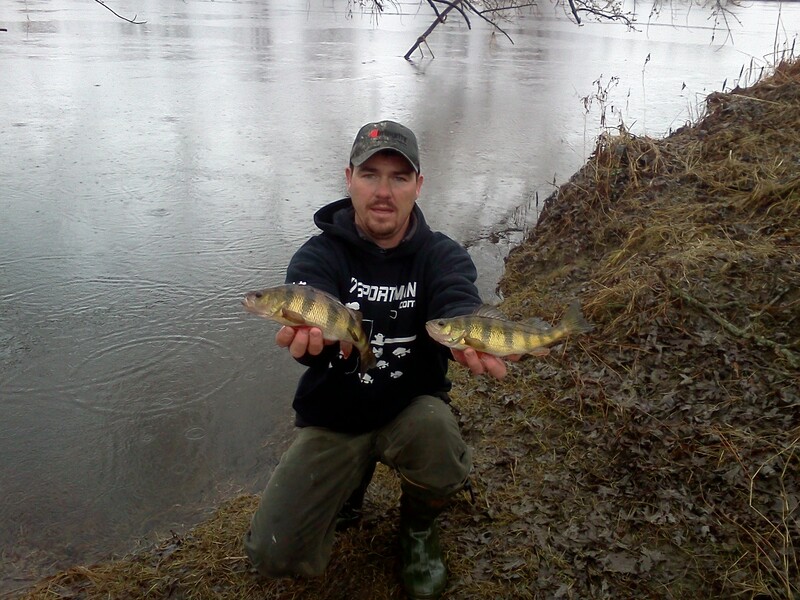 We found great fishing in the timber and along shoreline brush. That action seems to have come to an end. The surface temp on the river has dropped 12 degrees in two weeks, putting in now at 58.5 degree temp. The walleye are out roaming, well at least that’s what I’m assuming due to this below average day of fishing. I was greeted by cool temps and a slight drizzle when I pulled up to the launch on Saturday morning. It was a good thing I had my Blue Suit made by Ice Armor to keep me warm. Pulled up to my first spot that has produced awesome numbers this summer as well as two larger than average fish. The first drop is usually a sure bite, but nothing. I worked the area more and finally keyed into a change. The fish were there, maybe not in the numbers that we had seen during the warmer months and they were very lethargic, maybe cold rainy mornings make them stay in bed a lot later too. . . . . The key to the vertical jigging presentation on this day was to lay the bait on the bottom and slightly lift so that the jig would barely tickle the bottom. 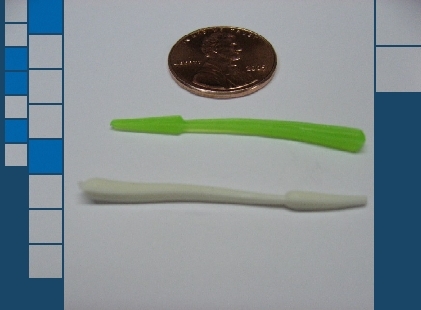 A fast action rod was also key today as most bites we undetectable until you lifted. I did hook into two nice fish, one shook the jig at the boat and another was a solid fish that got off after I pulled it from the timber, by the looks of the gold I saw when it rolled it was a nice one. 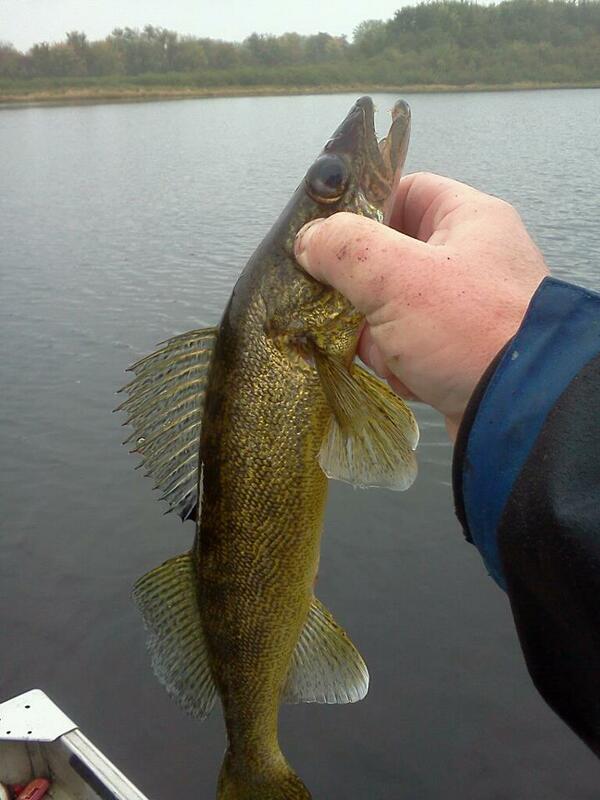 The only fish I boated at all three of my “go to” spots were three short walleye, a couple perch and a rock bass. Not a good average. No worries, the fish will move back onto to the structure, it’s only a matter of time before we’re back on the river vertical jigging for walleye. 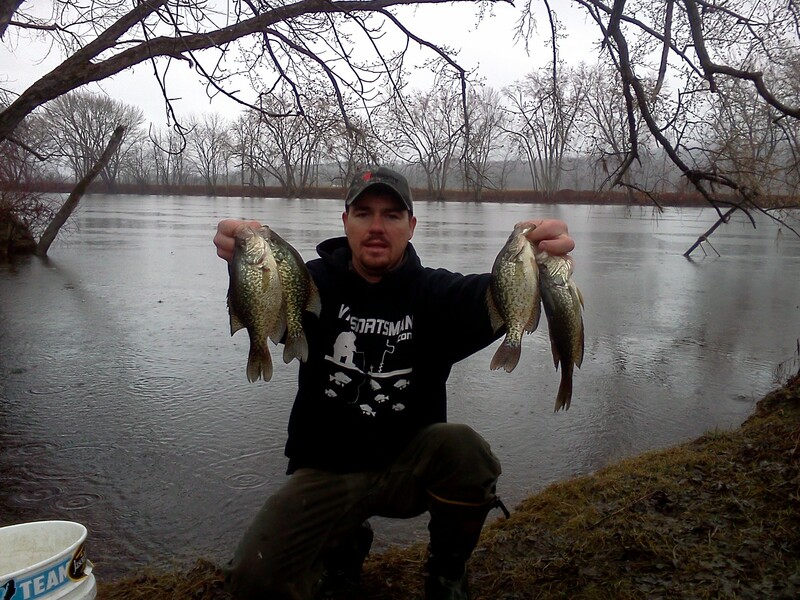 Check out Another Cold Day On The River on our YouTube page! So as you have seen in earlier posts, I had a pretty decent day at the VT Sportsman last tourney held at Dillenbech Bay on Lake Champlain in Alburg,VT last Saturday. There was certainly a lot of luck that lead to me to my final weight but some other things conveniently fell into place. To begin, the weather was the worst I have ever fished in. The temps weren’t bad but the wind was a steady 25mph at the get go and was gusting up to 55mph. Like most of these tournaments, I was going to have to spend a lot of my time inside my Clam Shack. I pre-fished the day before and found that the fish were not in the locations that they normally were in this bay. They had been the week before but the recent snowfall cover on the ice had pushed them elsewhere. It was up to Dylan and I to find that new location. I had a feeling that the school had pushed out into deeper water. We set out a little after six and walked right by the crowd which was right where we always fished and out to deeper water. As soon as I picked my auger up out of my sled the wind literally tossed my shack up side down and dumped all of it’s contents, the wind was blowing! That’s a 50lb shack empty. We cut holes and fished. 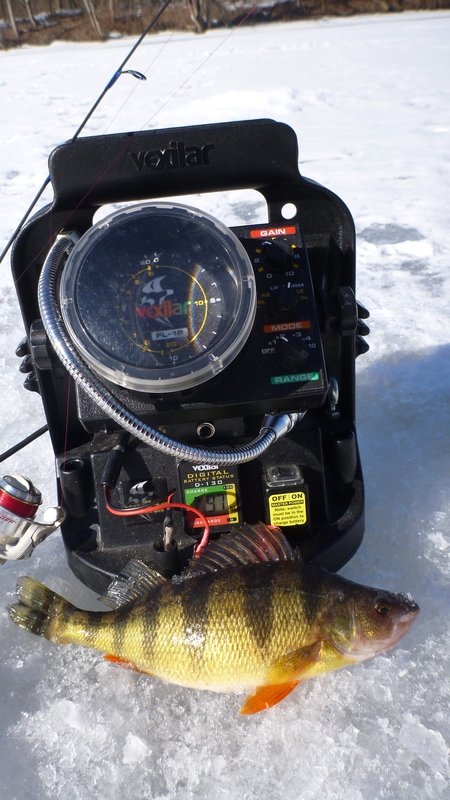 The first hour was slow, I managed to catch a few bluegill to put in the bucket but no crappie. I decided that I was going to work south towards a rather larger inside turn that I saw on my Navionics. 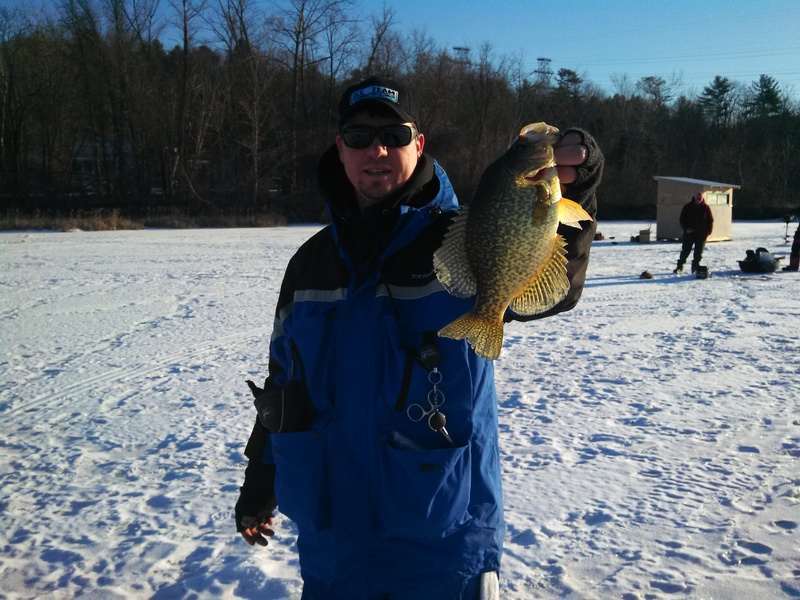 I cut a line of holes and at the end I caught a 10″ crappie. I punched more holes and brought Dylan and our buddy Mark over. At this point I was fishing out in the wind. In order to detect bites better I had switched jigs and tied on a HT Tungsten glow and chartreuse tipped with maggots. This added weight helped to keep my line tight in the hole and allowed me to feel the bites even with the wind gusting up to 55pmh. This was the first move that the weather caused me to make that would prove successful. Enough was enough, a fellow fishermen said he had been getting fish sight fishing, dead sticking minnows. So into my shack I went to see what was going on. 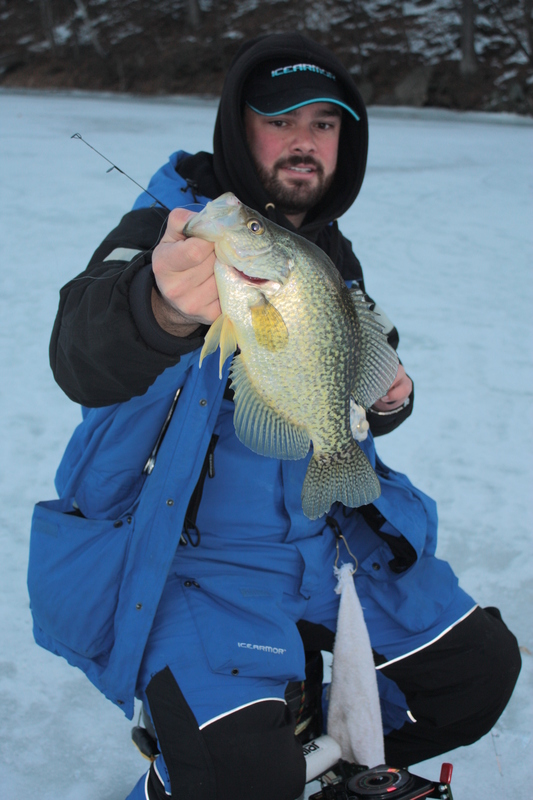 Truth be told, the Crappie were coming in right under the ice, anywhere between 6″-2.5 feet down. The minnows however seemed to scare them. I cut more holes and sight fished but had no hook ups. Finally, at about 10am the wind died and it started raining, more reason to stay in your shack right? Nope, not me, I got out of my shack with a feeling that this pressure change was going to turn the fish on. I grabbed my rod with my Tungsten jig and thought about plastics. Maki Plastics makes great baits. I’ve used a lot of his smaller profile baits this year but never really tried any of his bigger stuff. I open my bag and dug through what I had. I heard a voice in my head, the Voice of Jamie Vladyka, ” white is the Champlain color man”. I pulled out a white bait that was probably 2-3″ long, looked like a worm with a devil tail, the Spiiki. This bait was poison to the crappies for the rest of the day. By now the cat was out of the bag and fellow fishermen were quickly moving in to our location. 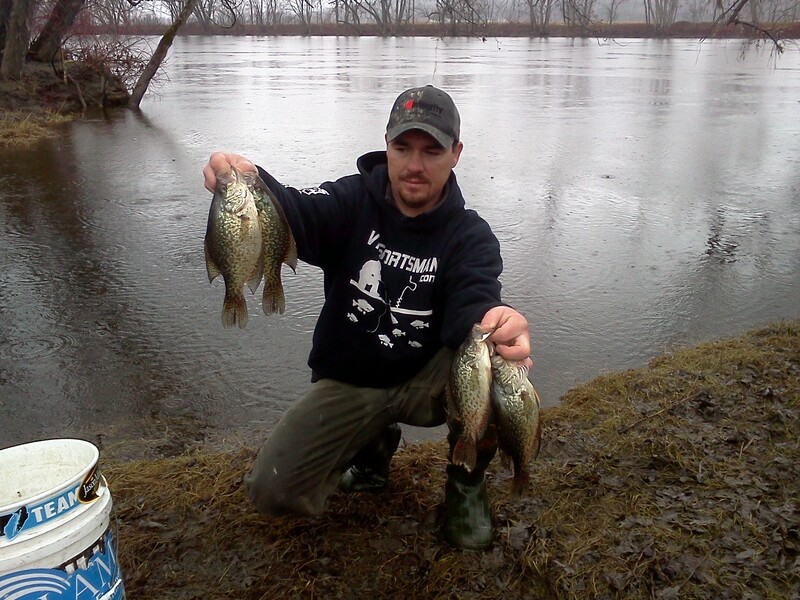 It was hard to hide scooping a 12″ crappie that was too big to lift out of the hole, oh well that’s tournament fishing for ya. The weather caused me to do two things that proved to be key today, one tie on a heavy jig, and two, rain and pressure change forced me OUT of my shack and the fished turned on. I ended the day with a 4.73 bag of 6 fish and the big fish of the day weighing in at 1.58lbs. A good day for sure! 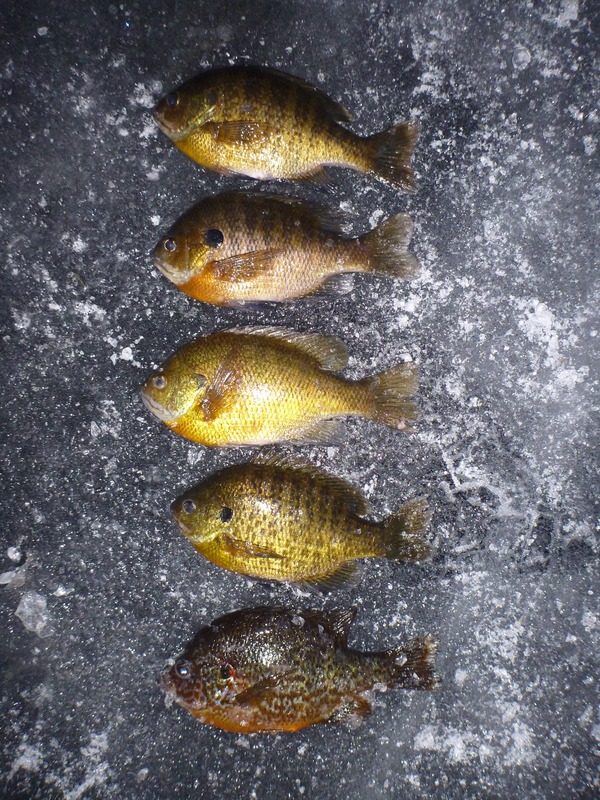 Went out for day number two of sight fishing for bluegill and pumpkinseed around 6am on an inland pond. First thing, the bite was on. Fish were suspended over the weeds in every hole. 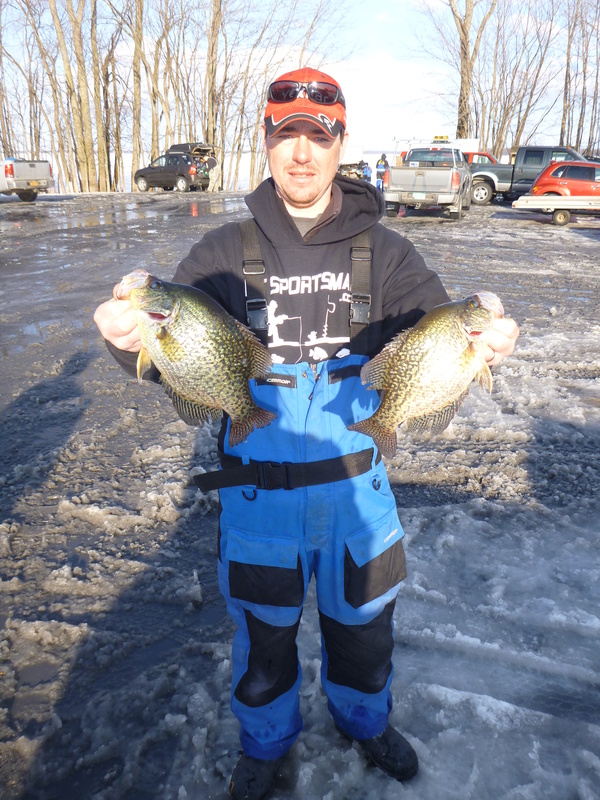 There were plenty of small fish mixed in with a few larger ones. I fished until they shut off around 9 and only the pickerel, pike, and bass seemed to be interested in any jig I tried. At this point I had been bit off by 6 pickerel/pike so I wasn’t too thrilled about fishing for them so I grabbed my camera and started scouting. I cut holes in both directions along the weed bed parallel with shore. The results proved to be no different so I cut shallower and deeper. These new holes held fish because I could see them using my Aqua Vu underwater camera but they were tucked into the ones that had the thickest weeds. I decided I should at least try to punch through them to get after the fish. I only found two holes that I was able to get through but they were productive. I caught 5 nice keepers between the two. I kept looking for holes that held fish. Although many did, it was practically impossible to get through to them. I kept returning to the two holes that I was able to fish but production slowed as the fish were fairly inactive. Around noon the fish started to move around below the weed line and I started catching them a bit more regularly but still slow. Right around the time the fish started to move I had a buddy show up. We talked for a bit, ate lunch, watched an eagle eat some fish that people had left on the ice earlier in the day, then got back to fishing. 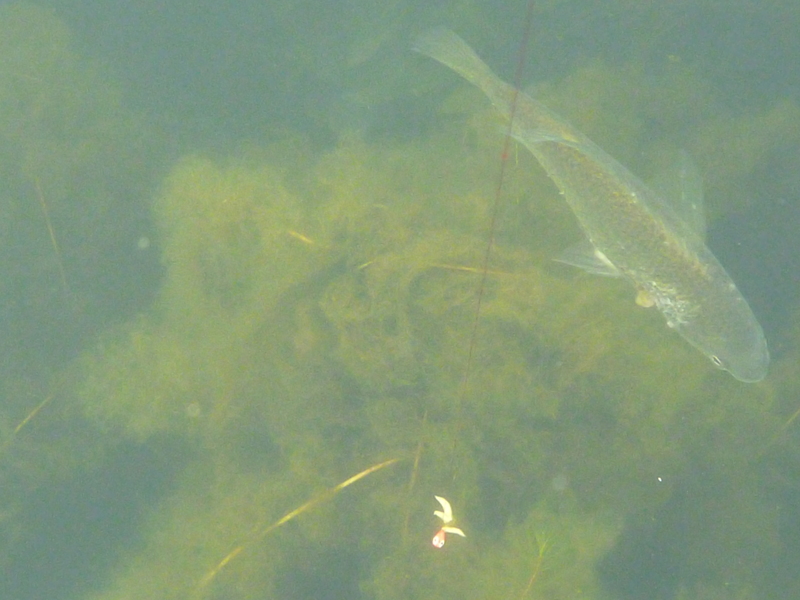 It was around 1:3opm when the fish started to come out of the weed bed in search of food. We both started pulling them pretty good at this point. There were a few holes that fell into “the honey hole” category so it felt good to have go to spots rather than keep fishing dead holes. The best hole we had was completely different from the others that produced. The weeds were alive and low, about 1.5 feet high, and had no dead weeds floating above them. The other hot holes were completely filled with dead weeds that floated back and forth the entire time with alive weeds below them. Obviously, the clean hole was pure sight fishing especially when the Clam flip over was used to dark everything out. The other holes were a bit tougher to fish. Sight fishing was not possible for the most part. I found a good rhythm for fishing them after a bit of experimentation. Because the dead weeds swayed back and forth I constantly got tangled up in them and my jig would get covered in slime. I learned to fish up and down the water column and only drop down into the weeds when an opening was made in the top layer of weeds. I found that most hits came when dropped after a long pause of waiting for the weeds to move. Ended up quitting for the day just before 6pm. It was a long day on the ice but it was a very good one to be out there. The fishing slowed as the sun set below the trees so we didn’t feel the need to stick around and waste time. After packing up, we made the long walk back to the car and headed home to get prepared for another day on the ice tomorrow! Come back tomorrow for another report!